This is the perfect gift for the beer lover in your life. The 64 oz dark glass growler will protect your prized craft beer all the way from the brewery to your home. 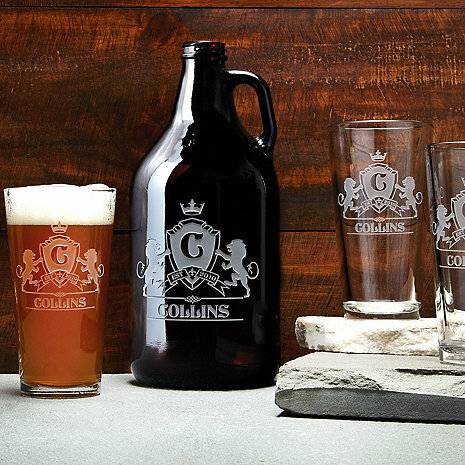 And what better way to enjoy a favorite brew than in a personalized pint glass. This set features a deeply etched personalization, up to 14 characters plus year and single initial. Dishwasher safe. I bought this for my son for Christmas as a keepsake for his home tavern. He loves it. The engraving was beautiful! I purchased this set as a farewell gift for my colleague at work who brews his own beer, and he and his family were pleasantly surprised at the etchings on the growler and the beer glasses. Cool gift for son in law. Quality was exceptional. The glasses and growler were very enthusiatically received by my daughters boyfriend. I did have two broken glasses that were replaced immediately and the customer service was stupendous.